The winner for my stop on the tour was Sheila Ivany. Congratulations, Sheila! The Quiltmaker staff will send out your issue. Enjoy! If you didn’t win during the week and will be looking for a copy of Volume 10, mine are on the way and will be up on my website soon, on the Patterns page. I also still have a few copies of Volume 9 if you need that one. Greetings gentle quilters!! 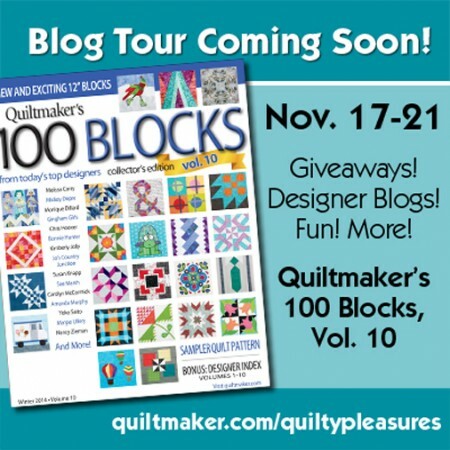 It’s Kickoff Day of the 100 Blocks Volume 10 blog tour! I’m so happy to have a block in this landmark issue. 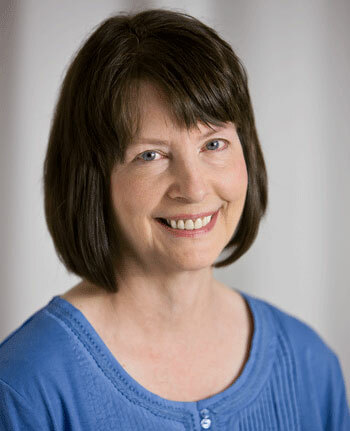 I’m Kay Mackenzie, a designer and author in Santa Cruz, California. 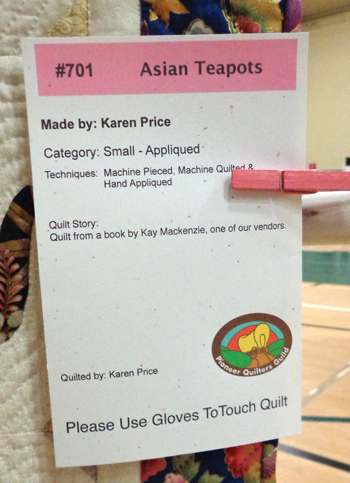 My website is By Kay Mackenzie, which has all of my books and patterns on it, plus select notions for the appliqué enthusiast. If this is your first time visiting my blog All About Appliqué, I’m so glad you’re here! You’ll find a wealth of information about all kinds of appliqué here on the blog, so take your time clicking around the categories, and use the keyword search as well. I’m delighted and proud to say that this is my ninth time having one of the 100 Blocks. (I must have been asleep at the switch for Volume 2.) I just love participating in these special issues, and golly! Ten times ten, that’s 100 different original blocks that have been published since the whole thing started. 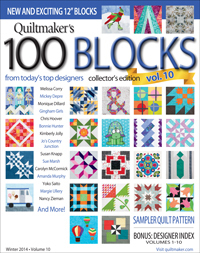 Quite an accomplishment… comgratulations to the Quiltmaker staff! 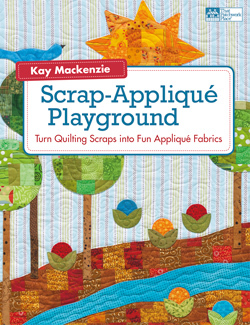 My latest title from Martingale, Scrap-Appliqué Playground, is all about different ways to put scraps together and cut appliqués out of them. After the book came out, I started playing around with more ideas for cutting appliqués out of something other than just one fabric. In the last issue I had Half-Log-Cabin Tulips. 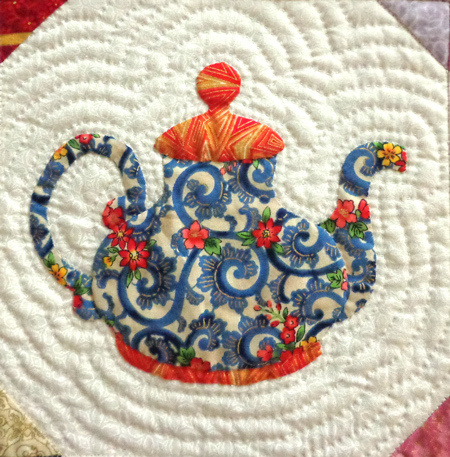 Another clever way to use a traditional pieced quilt block for appliqué is Nine-Patch Posies! 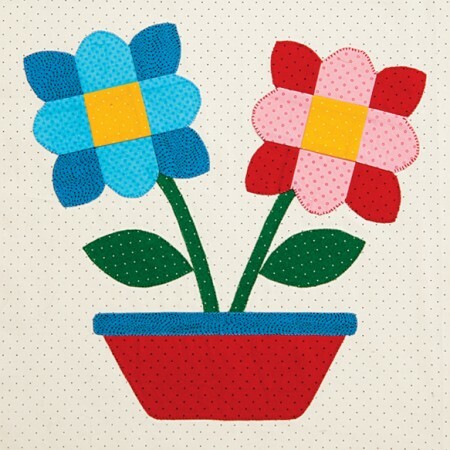 Cutting a flower “just so” from a traditional nine-patch block gives a fun, stylized look to a very traditional appliqué motif. Of course you can change up the colors as you like. 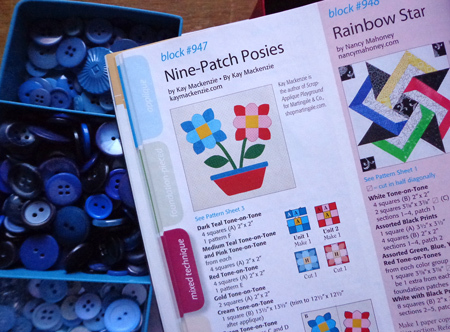 The magazine gives complete instructions for making the block, and includes the flower template that fits just right on the pieced nine-patch. Awesome. I hope you enjoy this block and all the other 99 fabulous and varied designs in Volume 10! 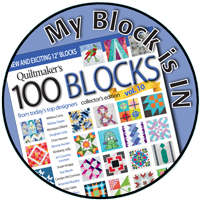 The editors of Quiltmaker’s 100 Blocks are sponsoring a giveaway of a copy of the magazine! If you’d like to enter to win, please leave a comment here on this post before 12:00 noon California time on Friday, November 21. 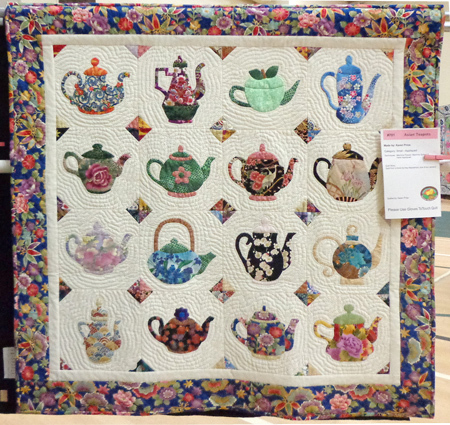 Over this last weekend I was in Roseville, California, for the Pioneer Quilt Guild show. 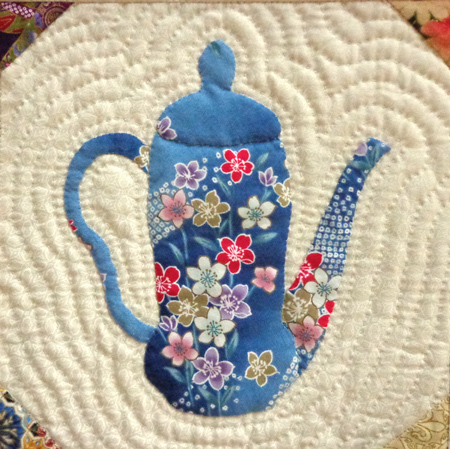 A quilter stopped by to let me know that she had a quilt in the show made using my Teapots 2 to Appliqué patterns. What a treat for me! Thank you for the shout-out, Karen! 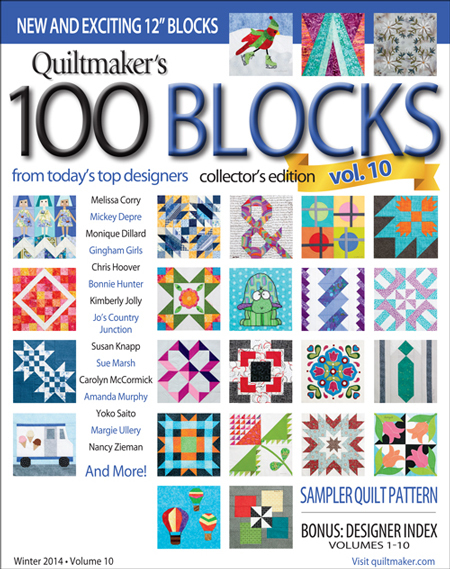 On another note, Volume 10 of Quiltmaker’s 100 Blocks comes out later this month. I have a block in there once again, I’m happy to say. The kickoff blog tour is November 17-21. These blog tours are lots of fun, with many prize-winning opportunities along the way. My day is Monday, November 17. See you then!